I love tortillas in all shapes and forms. Well, actually as far as shapes and forms go, I prefer them round and flat… but anyway. Hungary, surprisingly, not as big on Mexican food as America. Whoda thunk it. 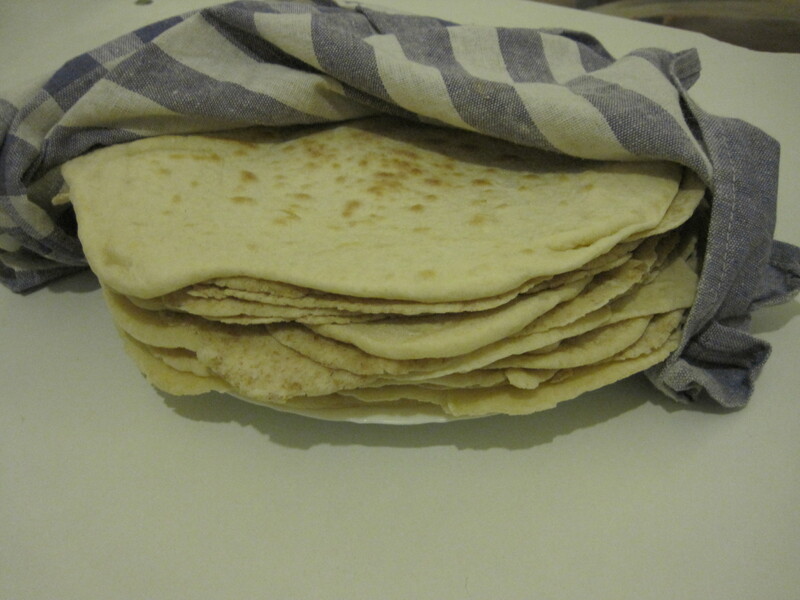 Tortillas are available in the big shops, even in my town, but they are a little bit expensive (600 forint / 3 dollars for a pack of small ones). Plus, I always like it better if I can make things from scratch, without all the nasty chemicals and preservatives. Either way, tortillas are easy enough to make from scratch. If you’ve never made bread before, tortillas are a good one to start with, because the whole yeast / rising thing isn’t so important! 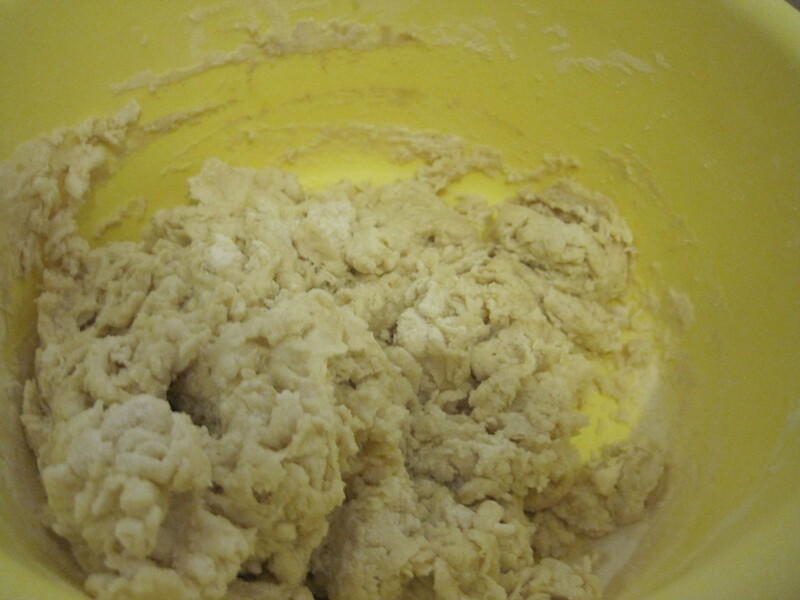 Mix it up until its all combined, then knead it for a couple minutes more. The kneading isn’t too important, because as I mentioned before, tortillas don’t need to rise. 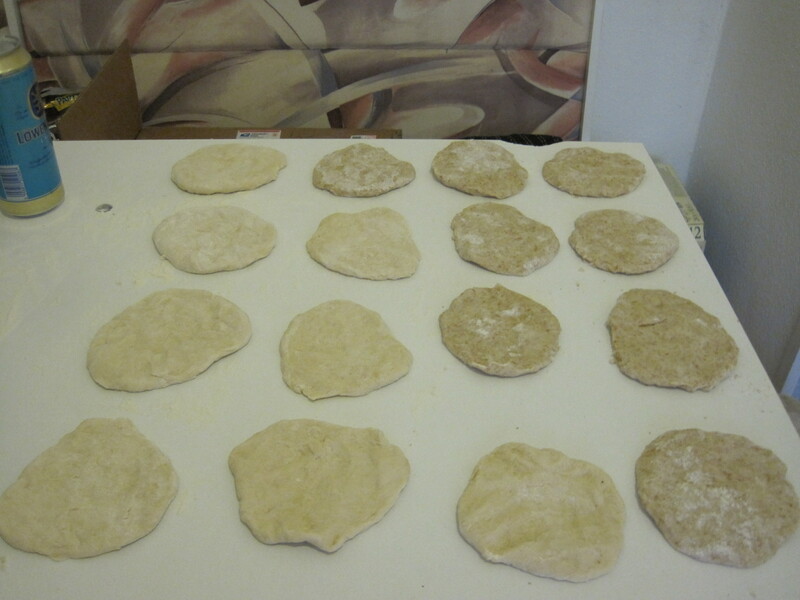 Divide the dough into 8 pieces and pat them into circles about the size of your palm. Cover them with a towel and let them rest for about an hour. Longer is fine too – the point here isn’t to let it rise, just to let the dough rest. At this point you can also make pita bread. You would just let the circle rise, then bake them in a hot-as-possible oven for 15 minutes. If you have a baking stone, use that. You can also use a skillet on the top of the stove. But since we’re making tortillas, after an hour you’re going to roll them out. If you have a tortilla press, lucky you! If not, a rolling pin will work. 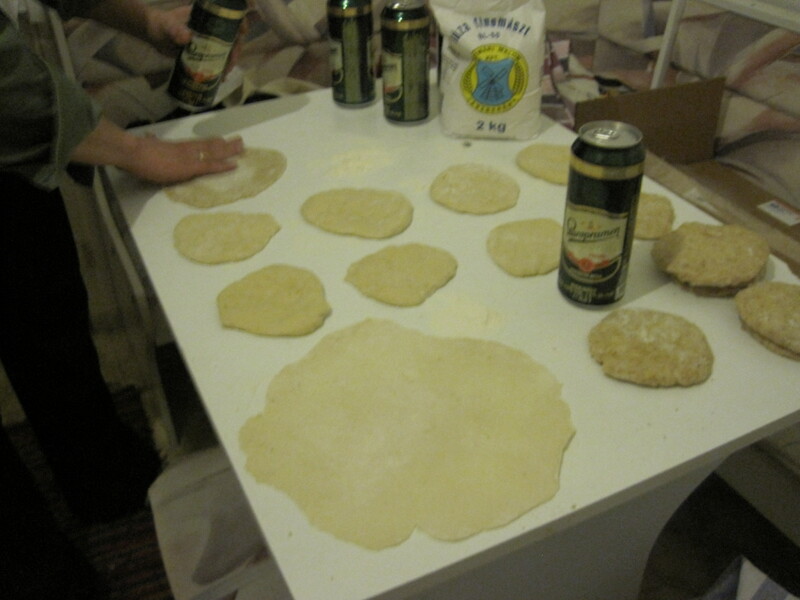 Or, if you’re like me and don’t even have a rolling pin, a beer can works perfectly. Roll from the middle out, trying to push a little bit out each time. 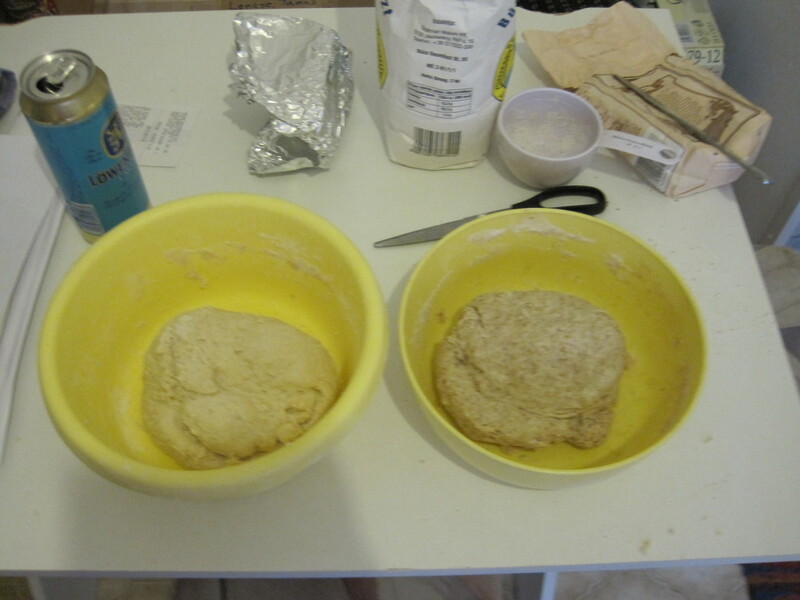 Work slowly and rotate the dough often, and flip it over. Keep dusting with flour. If you’ve divided the dough into 8 pieces, you’ll be able to roll it out into a 12″ tortilla. It will seem impossible thin, probably you’ll be able to see though it in places. If you tear it, just pinch or smooth it back together. When you’ve got a circle rolled out, its time to cook. 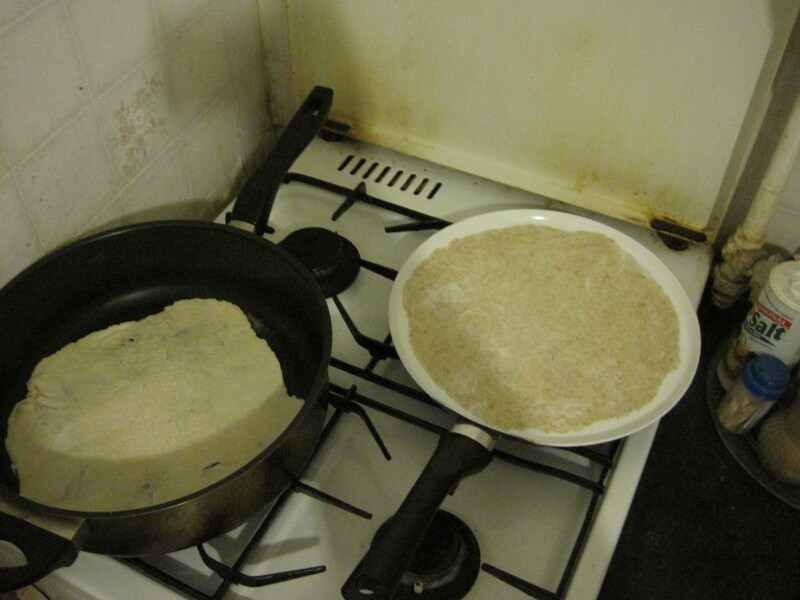 Use medium to high heat, and cook the tortilla for 1-2 minutes on each side. If you under-cook, no problem, it will still taste great. If you over cook, make some salsa and call it a tortilla chip! These are best eaten fresh, although they have a shelf life of several weeks, especially in the fridge. After a few days they will get a bit dry and harder to roll up without cracking. That’s when you should make them into chips by sprinkling them with salt, chili powder, and baking them in the oven for 10 minutes. This entry was posted in food and tagged from scratch, own recipes, tortillas. Bookmark the permalink.